A toaster waffle from the frozen foods section of your supermarket is a pale imitation of a freshly baked waffle, crisp and steaming from your waffle iron at home. The only problem with those glorious homemade waffles -- aside from washing the mixing bowl afterward -- is that making enough to feed a group can be a real challenge. They come slowly from the iron, so it's up to you to keep them hot and crisp until you have enough to call your crowd to the table. If you think your home oven is the most practical place to keep your waffles warm, you're right. Keeping them crisp is another matter. Start by heating your oven to 200 degrees F. That's warm enough to keep the waffles hot without drying them out. Disregard the oft-repeated advice to lay your waffles in a single layer on baking sheets lined with paper towel. The waffles will continue to steam for several minutes after leaving the iron, and the towel and baking sheet will trap that steam and make your waffles soggy. Instead, transfer your fresh-baked waffles directly to the oven rack. From there they'll shed their steam directly into the warm air of the oven, and retain their crisp texture. You can easily fit six big, round Belgian-style waffles on a standard oven rack, so with two racks, you have space to keep up to a dozen waffles hot. Before you plan a waffle breakfast or brunch, take a moment to consider your production capacity. Depending on your waffle iron, a thick Belgian-style waffle can take up to 5 minutes to cook. They're at their best when kept warm for no more than 20 minutes after baking, so this represents a limit on the numbers you can serve. In this instance, it would mean a total of five -- the last one coming out of your iron as the first one reaches the 20-minute mark -- cooked ahead before serving. If your iron takes only 3 minutes, you could manage one in the iron plus seven in the oven for a total of eight. If that doesn't match the number of people you're feeding, you might need to buy or borrow a second waffle iron. To tilt the odds further in your favor, don't rush the cooking. That's always a temptation when you're racing to get a meal on the table, but with waffles, it's a mistake. Their airy texture comes from baking a wet batter into a dry, crisp finished product, and if you don't cook your waffles long enough they'll retain more moisture than they should. This, in turn, makes them prone to sogginess. Don't judge your waffle by its color. Instead, watch the steam escaping in great billows from the waffle iron. Your waffles aren't done until the steam begins to subside. No matter how good your grandma's waffle recipe tastes, you might find it just isn't suitable for preparing in advance. 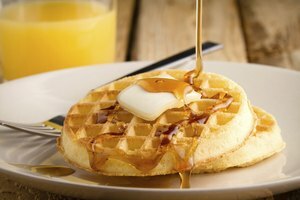 Even subtle differences in the relative quantities of eggs, milk, flour and sugar can affect your waffles' crispness dramatically. Try multiple recipes ahead of time -- your family certainly won't object, and they can be frozen and reheated for later breakfasts -- and see which ones produce the crispest, longest-lasting waffles. 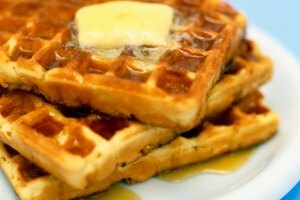 By comparing those recipes, you can incorporate their best ideas and techniques into your own personal take on the perfect waffle.